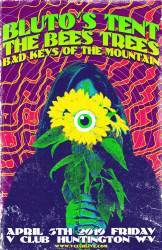 Bluto's Tent & The Bees Trees join forces in Huntington, WV! The Bees Trees (YOUNGSTOWN, OHIO) deliver a dynamic fusion of melodies that highlight a wide range of musical influences - including funk, roots rock, reggae, jazz and blues. By frequently performing in a variety of venues - from taverns to music festivals and theaters - they deliver their unique sounds to an eclectic audience.